Palmiers (elephant ears) are relatively easy to make, taste delicious, and make an impressive display. The recipe below uses prosciutto and parmesan, but there are many other variations you can try - basil and sun-dried tomatoes, turkey with swiss and baby spinach. Anything that goes well together in a sandwich would work here. Lightly flour your work surface. Unfold the puff pastry. Roll the puff pastry out into an approximate 12" square. To help keep it even, roll from the middle towards the edges. If the pastry feels like it's starting to stick, gently lift it, place more flour on the work surface and the rolling pin, and turn the pastry. Dollop the mustard is several places on the pastry. Using a silicone spatula or the back of a spoon, spreadh the mustard evenly over the pastry. Lay the prosciutto over the mustard, tearing it into pieces if necessary to create an even layer. Sprinkle the grated cheese over the prosciutto. Staring with the edge closest to you, being rolling away from you, towards the middle, into a tight log. If you need help getting it started, use a bench/dough scraper (as mentioned in the post My Favorite Cooking Tools) to lift the dough. Repeat the rolling with the far edge, rolling towards you. When you're done rolling, you can wrap the log in plastic wrap and refrigerate it for one to two days, or continue to the next step. Using a sharp knife (serrated would be best), cut the log into 1/2 inch slices. Place them on a baking sheet lined with parchment paper. 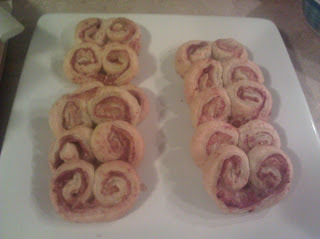 Bake for 20-25 minutes until the palmiers are golden brown.